Even though Ian Mackay is a native of California, there is no doubt that he fits perfectly in the Pacific Northwest where he now lives. Ian is passionate about nature and he is also a beer enthusiast. This is a perfect combination for exploring the great outdoors with the goal of making it accessible for all. As a botany nerd with a background in Biology, nature has always recharged Ian. He loves to spend time outside, riding. In 2008, while riding home from a college class, Ian crashed his bike and sustained a C2 spinal cord injury that left him a quadriplegic. After his injury, there were many things that Ian could no longer do (at least not in the same way). Ian had to work through the many changes that his injury brought but eventually he realized that he was still Ian, the same guy who loves botany and the outdoors; and since then, nature has been a part of his healing process. Before his accident, Ian and his friends took many bike tours; each day, these adventures would end at a brewery where they would enjoy a cold beer together. 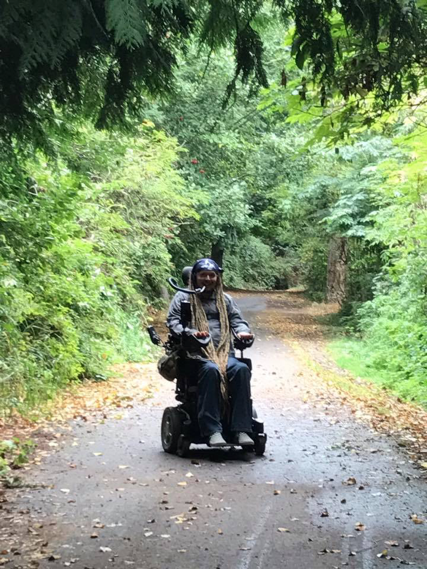 Ian, who now uses a power wheelchair for mobility, decided to replicate his bike tour experiences as part of his healing journey. He decided to ride his wheelchair across the state of Washington and end each day with a cold beer at a brewery, just as before. During these excursions, Ian discovered one of his favorite breweries, The Dirty Bucket located in Woodinville, Washington. This brewery serves a dark beer, the Ruski Porridge Oatmeal Stout; even though Ian is typically an IPA drinker, this stout is one of the best that he has ever enjoyed. Not only did Ian find a delicious beer on this ride, but, this experience gave him the confidence that he can ride again. It has also has opened up conversation within the community; all people can and should enjoy nature — yet, access is the key to be able to fully enjoy the outdoors. Those of us with disabilities are limited in our access to trails. Ian has found that the least accessible trails tend to be within national and state parks. These trails typically cater more to the hiker and less to the wheelchair user as it is difficult to preserve wild lands and make them accessible by changing up the terrain and paving the pathways. Though many of the pathways on Mt. Rainier are paved, the terrain is so steep that it is still difficult for many people with mobility differences to access the entire experience of the mountain. However, the steep terrain is potentially an issue that cannot be overcome. Ian went on to say there is a need for more accessible trails; but what this actually means is ambiguous as there are a vast variety of needs and what is accessible to one person may not be accessible to another. When asked, Ian expressed that picking a favorite trail was tough, but the Olympic Discovery Trail — a local trail on which he rides almost everyday — definitely rates in his list of favorites. The Olympic Discovery Trail is one of the longest accessible bike trails in Washington State; it stretches 34.7 miles from Blyn to the Elwha River. Ian described the scenic beauty of the diverse birds, foliage and surroundings in general; he talked of being engulfed by the woods, the feeling of being in the middle of nowhere, the different bridges and crossings, and riding next to rivers. Ian is not allowing the use of a wheelchair nor the lack of accessibility to stop him from doing what he loves. Prior to 2017, Ian’s personal riding record (in his wheelchair) totaled 2,600 miles in one year. Ian set out to top his best with a goal of 3,000 riding miles for 2017. He was also determined to ride every single day of this year. Ian accomplished his goal of riding 365 days in 2017, and he surpassed his goal of 3,000 miles by traveling a whopping 4,700 miles. Ian expressed that he does not have a mileage goal for this current year. Instead, he is hoping to dedicate this year to more advocacy work; however, he still plans to ride every day of 2018. Nature is the best medicine; it benefits us all. We all should take Ian’s message to heart and get outside.